Besides the action, it was really interesting to see how this film was able to tap into its horror roots, so to speak. There were plenty of jump scares and "Zummies" (zombie mummies) to help create some really tense moments in the movie. I think they did a pretty decent job with the CGI effects for the most part. To top all of that off, there were some humorous moments of comic relief that may get a bit of a chuckle out of you here or there. 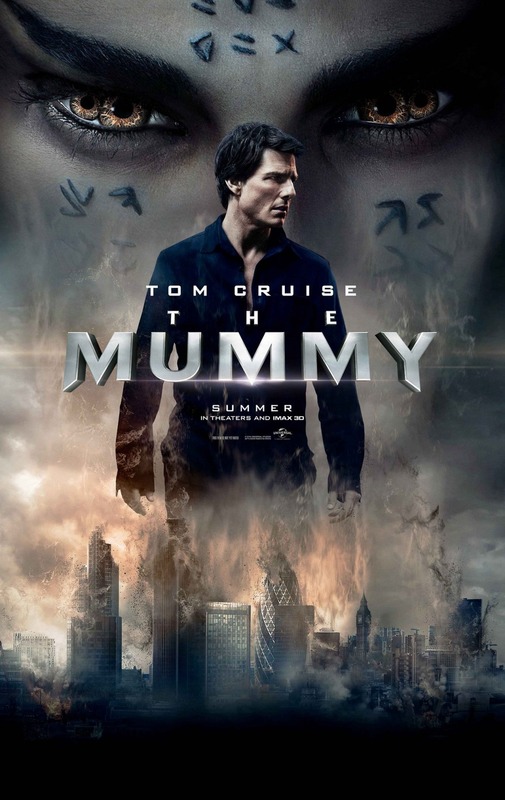 I think that without question one of the biggest highlights of this movie was Sofia Boutella who plays the Mummy. She was simply captivating every time she was on the screen. Dare I say, she was more intriguing to watch than Tom Cruise's character for the most part too. She was able to carry a sense of terror and beauty simultaneously. This movie tried to do way too much all at the same time. While it did have a mixture of action, horror and comedy it simply didn't blend well. (It reminds me of when you're trying to make a healthy shake without all the ingredients mixing well. Then when you drink it, there are lumps and chunks of random things you can no longer identify.) There were just one too many cheesy one-liners from Cruise in my opinion. Rather than allowing someone like Jake Johnson's character to shoulder the comedic relief, I think it was a misstep to have Cruise take that on as well. Unfortunately, I can't go into detail, but I am not a fan of what they did with Tom Cruise's character. The way they end the movie, in my opinion, feels like the wrong direction if this will truly be a new "monster universe" film franchise for the studio. Cruise's character is left to make a decision by the end of the film, and I just don't think it made a lot of sense. Honestly, it was just really impractical and unbelievable. One of the reasons why is because of the forced and unrealistic relationship between Cruise and Annabelle Wallis' character ("Jenny Halsey"). Both of their characters have a rushed and unauthentic relationship that doesn't help make any sense of the actions taken later on in the movie. I suppose it was also bit disappointing in regards to the lack of originality in this film. As I mentioned before, some of the action scenes looked really familiar to Tom Cruise's past films. In addition to that, there's a scene of the mummy that looked almost too familiar to the latest Power Rangers movie and Rita Repulsa's character coming to life. To make matters worse, the film's marketing probably didn't help with the spoilery trailers. They revealed, I think, too much with Russell Crowe's character. Even when we finally do see Crowe, his character is a bit underwhelming. They could've left his character as a shadowy figure that operated behind the scenes. Otherwise, some of his scenes could've been deleted and the movie wouldn't have skipped a beat. The movie studio is clearly trying to use The Mummy as a setup movie for their future "monster universe" films where they will be introducing more characters. (ie: Wolfman, Invisible Man, etc) It's really hard to see what direction this franchise is about to take. I can't tell if it wants to be something like Hellboy, Suicide Squad, or random monster movies in general. Given what we saw in The Mummy, I'm not all that excited to see what happens next. The story and the easter eggs just felt like they were all over the place and overexerting themselves to promote future films. Unfortunately, I don't think that The Mummy will live up to the hype or expectation of a typical Tom Cruise movie, nor to the success of the the past Mummy films in the late 90's or early 2000s. While on paper this should be a solid home-run film, I think it's more a bunt play. (Whether they make it safe to 1st base will be your call.) If you're interested in the potential universe they are trying to create, then you obviously will have to watch this movie. Oh and the 3D was simply not present enough to warrant seeing it that format. You get a few scenes here or there that pop out at you, but afterwards you forget you're watching a 3D movie. I think this movie is something you watch when your local theater is having a discount showing or matinee. At that point you can probably enjoy it a bit more. I think some people may still enjoy this film and ignore its many flaws, so I would just say go in with low expectations, avoid the trailers, and pass on the 3D. If you do that, you'll probably enjoy the film for what it's worth.